The Legend of Tarzan – Does the world need another Tarzan (movie)? No. But at least it’s way better than I – and most everyone around me – expected it to be. The Legend of Tarzan offers a new take on an old tale, with a healthy dose of eye candy. Swedish actor Alexander Skarsgård (True Blood) plays John Clayton III aka Lord Greystoke aka Tarzan. John has traded in the jungles of Africa for a gentrified life in London with his sassy and beautiful wife Jane (Margot Robbie). He’s perfectly content to be free of the Jungle (“It’s hot there”), but he is roped into accepting an invitation to return to the Congo to serve as a trade emissary of Parliament, unaware that he’s being set up by a nasty Belgian dude (Christopher Waltz in his usual creepy, sneering role) who plans to turn Tarzan over to an African chief bent on revenge. The movie has elements of a lot of genres – there’s romance, drama, action, (CGI) animals, comic relief (from Samuel L. Jackson as an American, George Washington Williams, looking to expose an illegal slavery and mining operation) — but it all hangs together surprisingly well. The Legend of Tarzan feels a lot like a standard superhero flick, which makes it perfectly fine summer fare for the older kid/adult crowd. The BFG – If you know what the ‘BFG’ stands for and/or have read all the books by Roald Dahl, then you’ll probably like this movie well enough, and some may even love it. I found it just okay. Disney and legendary director Steven Spielberg bring the story of The BFG (Big Friendly Giant) to the big screen in all its (unnecessary-to-see-in-3D) glory. Wee ones may not appreciate its rather dark beginnings though. It revolves around the story of a cute and precocious little girl named Sophie (Ruby Barnhill) who gets snatched from her orphanage by a 24-foot Giant (an animated, yet photorealistic version of Oscar-winner Mark Rylance) and whisked away to Giant Country, ostensibly forever. Why? Because she happened to catch a glimpse of the BFG while he was on a covert mission to deliver dreams… and that’s a giant no-no. Fortunately, The BFG is an endearing sort who means Sophie no harm, unlike his carnivorous brothers. The movie lightens up and takes a much more entertaining turn when the duo visit the Queen of England to enlist her help in the fight against the not-so-friendly giants who like to snack on kids. At that point, the movie picks up the pace and carries more of a Princess Diaries meets Annie meets Alice in Wonderland vibe. Overall, it’s a visually impressive flick that starts off a bit slow and drags heavily in the middle, but redeems itself in the end, and most importantly – the kids seemed happy with it, especially whenever a giant green fart was unleashed at the breakfast, lunch or dinner table. Good times. At least it was 3D and not smell-o-rama. Hunt for the Wilderpeople – You may have to do a little bit of hunting to find this movie at a theater near you, but it’s worth it. It’s an indie that should appeal to the arty crowd as well as mainstream movie-goers who can appreciate a small but solidly-entertaining quirky dramedy. I went in cold – with no expectations – and left with a total sense of cinematic satisfaction. It’s the story of a troubled, rotund, hip-hop-obsessed city kid named Ricky Baker who’s been shuffled around the foster care system in New Zealand for several years. Things start to turn around for Ricky (Julian Dennison) when he’s sent to live on a farm with a sweet and loving foster mother, Bella (Rima Te Wiata), and her gruff but accommodating husband Hector (Sam Neill). The ‘Hunt’ refers to a chase that ensues across the countryside when child protective services tries to bring Ricky back to the city for what they think (or claim) is his own good. It’s a dark-comedy-drama-adventure movie with heart that takes us along on the odd but endearing journey of two lost souls who come to rely on each other. I hope the performances of both Neill and young Dennison are remembered come award season. Hunt for the Wilderpeople is directed by Taika Waititi (What We Do in the Shadows) who apparently has quite the cult following. I wasn’t familiar with his work, but he did hook me in at the start of the screening with a pre-recorded message of gratitude to those attending the preview. His quirkiness was apparent from beginning to end. And I was charmed. 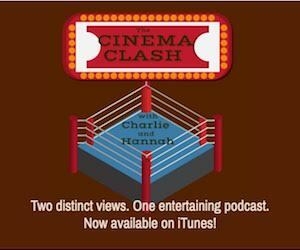 For more discussion and debate on the movies listed above, and other stuff too (including a huge disagreement about Wiener-Dog), tune in to Cinema Clash with Charlie and Hannah. New episodes of the podcast air weekly on radiostpete.com, about 5:10 p.m. on Saturday and 9:10 a.m. on Sunday.